Knotty Knotty Crochet: smile maker FREE PATTERN! BOO! haha! isn't this guy fun? I hope he made you smile! 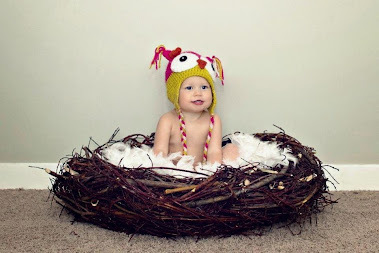 This is just a little something that is super easy to do and uses up a bit of that leftover yarn. I love photographing my kids, but every once in a while, when I tell them to smile for the camera, I get some pretty funny faces! I tried this one out on my kiddos and actually got nice, genuine, almost laughing type smiles. I just used a hair elastic so that it would hold on to any of my camera lenses. Row 2) 2 DC in each dc around join with sl st.
Row 3) 2 DC in first dc. 1 DC in next dc. Repeat around, fasten off. I made an eye by following the same pattern in the owl hat pattern, and a tooth by following the beak from the owl hat pattern. I placed a pipe cleaner under the eye before sewing it on. I would love to see the finished products! 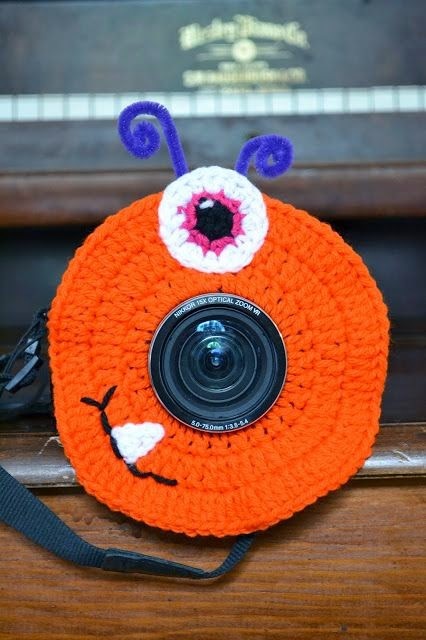 Please post photos of any that you have made on the Knotty Knotty Crochet GROUP on facebook! Minions oh minions! FREE PATTERN!